ClutchXperts Stage 3 Racing Clutch Kit is a brand new heavy duty racing pressure plate with 6 puck sprung racing disc setup can hold up to 389HP and 345lb-ft of TORQUE and 60% more pressure increase over stock. 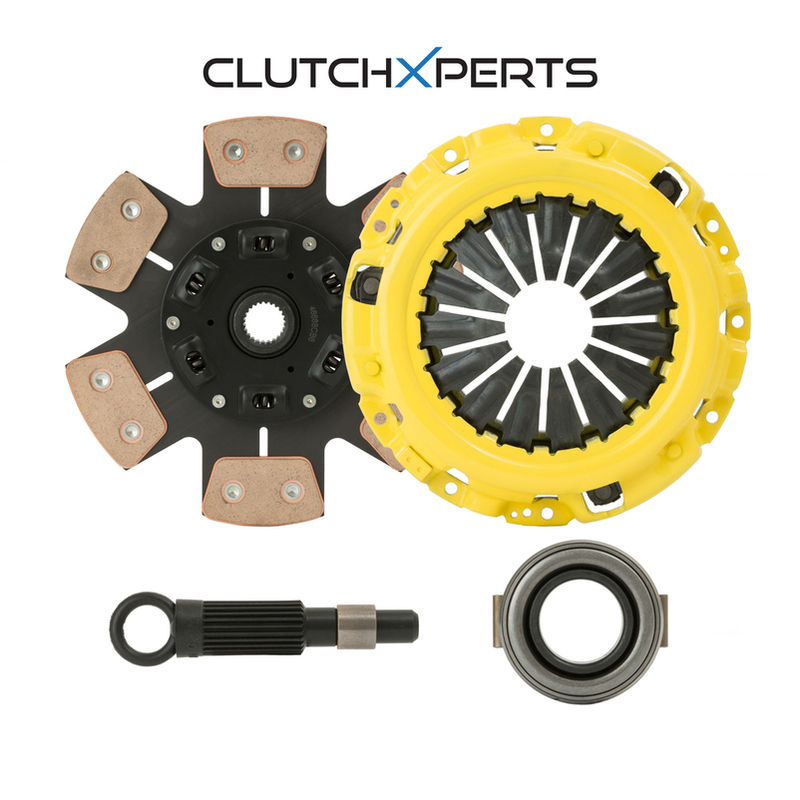 The ClutchXperts Stage 3 racing clutch system uses ClutchXperts Stage 3 Heavy duty pressure plate with 6 puck sprung ceramic disc. This is ultimate extreme-duty street or road / drag racing system. It is built using a special 6-wing ceramic button design disc for long life, outstanding holding capacity and high heat dissipation. All ClutchXperts Racing pressure plates are made from ductile iron (2300 LBS CLAMPING LOAD) which is about 60-70% stronger than conventional cast iron pressure plates other racing clutch manufactures use. It is recommended for use with 'modified' vehicles used for "street and strip". This unit has also proven itself to be very capable for four wheel drive and off-road use, also heavy duty towing and commercial applications. It offers 80% more holding capacity than a stock 'OEM' clutch while maintaining a stock pedal feel. If you want the best the industry has to offer -- Ask for ClutchXperts 6 Puck Sprung Racing Disc. The ClutchXperts Racing 6 puck strip disc also uses our high torque internal assembly, but goes one step further in terms of friction. This disc uses an advanced hybrid iron and carbon combination delivering aggressive bite and increased thermal capacity. Uncharacteristic of the typical aggressive racing disc, the ClutchXperts disc provides outstanding stability, smooth engagement, and less wear on opposing plates. This combination has proven to be premier unit with regards to both performance and driveablitity for the daily driver with serious torque holding requirement. This system is recommended as the finest quality 'upgrade' from the original equipment clutch.This kit comes with everything you need for a new clutch job or clutch upgrade. Lastly, resurface and rebalance the flywheel prior to installation for best performance and result! **The throwout bearing and pilot bearing (if required) included ($80 value) for free! Street or Long life of clutch BREAK-IN required. Free shipping within lower 48 States via USPS Standard. For Expedited Shipping please refer to Payment options. Email us for AK, HI, PR and International Shipping Rate (USPS Priority Air Parcel). PAYPAL CONFIRMED ADDRESS ONLY. WE DO NOT SHIP OTHER THAN A PAYPAL CONFIRMED ADDRESS. FREE SHIPPING WITHIN 48 CONTINENTAL STATES (3-6 BUSINESS DAYS) VIA USPS STANDARD PARCEL. 3 PRIORITY SHIPPING, YOU CAN SELECT USPS PRIORITY AS SHIPPING OPTION, JUST ADD $15.00. FOR INTERNATIONALS SHIPPING $79.00 AND $149.00 FOR CLUTCH AND FLYWHEEL COMBO SET VIA USPS PRIORITY AIR MAIL. For 2-6 Business days DHL Express For Urgent please send message thru eBay messaging system for quotation. DHL EXPRESS IS THE FASTEST WAY TO GET YOUR ORDER FOR INTERNATIONAL BUYERS!! WITHIN 10 Days UK Guaranteed! RMA # : Message us through eBay for RMA#. We do not allow any return without RMA#. Return Shipping : Buyer is responsible for return shipping cost. Exchange : Up to 30days from of purchase (Brand new condition, no restocking fee). All returns will be subject to 20% restocking fee. Return your purchase for up to 30 days from date of purchase for a refund. Must be in brand new, resalable condition. Damaged Item : Message us through eBay. Manufacturer Warranty : 3 months or 3,000 miles(whichever comes first) from the date of purchase. Please contact us through eBay messages by clicking on "Ask a Question". Business Hours : 9AM - 5PM Mon-Fri (Pacific Standard Time).